The best way to experience Mass Street, in its totality, is to start at 6th and Massachusetts and walk south. The walk will take you past the shops, restaurants, and outdoor patios, until you end up in a dreamy green space known as South Park. There are so many reasons to appreciate this generous piece of land specifically reserved for recreation and relaxation. With the summer in full swing, the amenities this park offers are ever abundant. 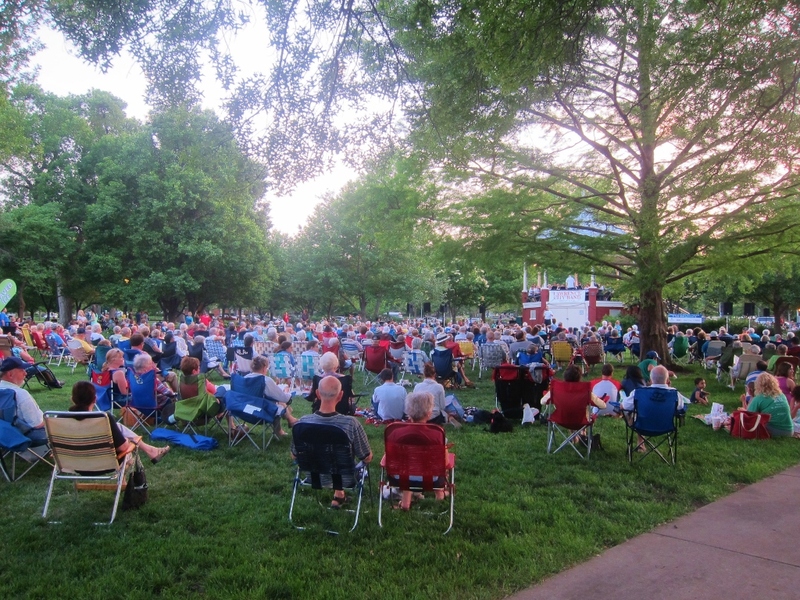 Our evening enjoying the Lawrence City Band's summer concert. ... and we certainly weren't the only ones. GREAT turn out! 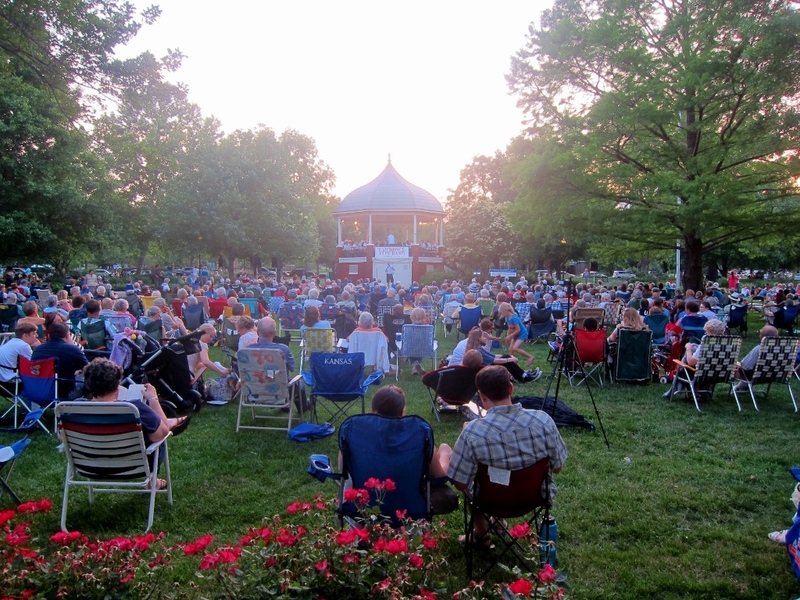 For starters, the Lawrence City Band’s summer concert series started up in late May and will run through July 16th (providing a total of eight summer concerts). 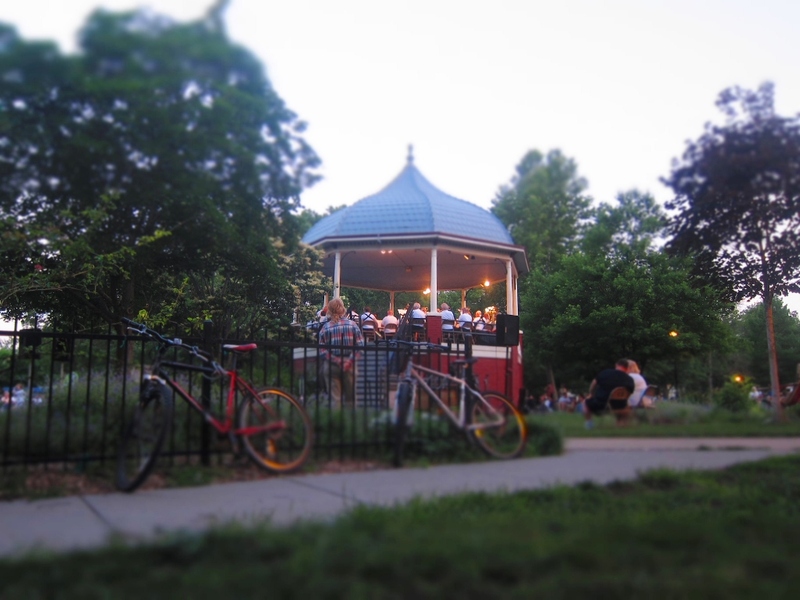 Every Wednesday, head down to South Park (the east side of Mass – near the William Kelly Bandstand) a little before 8pm and find a cozy spot to sit and enjoy the live music. 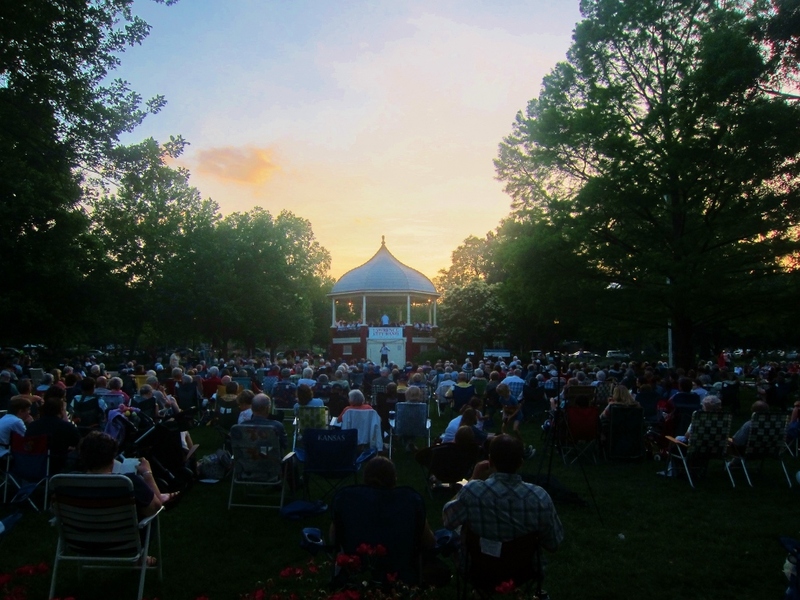 We were able to make it to the second concert, which had the theme of “summer in South Park”. The lively marches and melodic overtures set the tone of the summer night; the children ran barefoot in the grass and the surrounding adults escaped with the band. This lovely evening really made summer feel authentic and present. A little earlier in the mornings – and evenings – South Park turns into a sweaty mess of people dedicated to serious workouts. The summer schedule for Red Dogs Dog Days began in early June, meeting in South Park at both 6am and 6pm Monday-Thursday. There is no cost to join in on this hearty workout, but interested parties do need to complete a signed waiver (which can be found on the website). Yep, just a few more of the summer concert. Later this month, on Saturday, June 28th, Lawrence Parks and Recreation is hosting a 2014 Summer Fest. From 10am-5pm, South Park will be full of live bands, arts & crafts, food and drink vendors, and kid’s activities, too. It sounds like an event that is not to be missed! South Park is not short on worthwhile events for anyone and everyone, especially in the summertime. 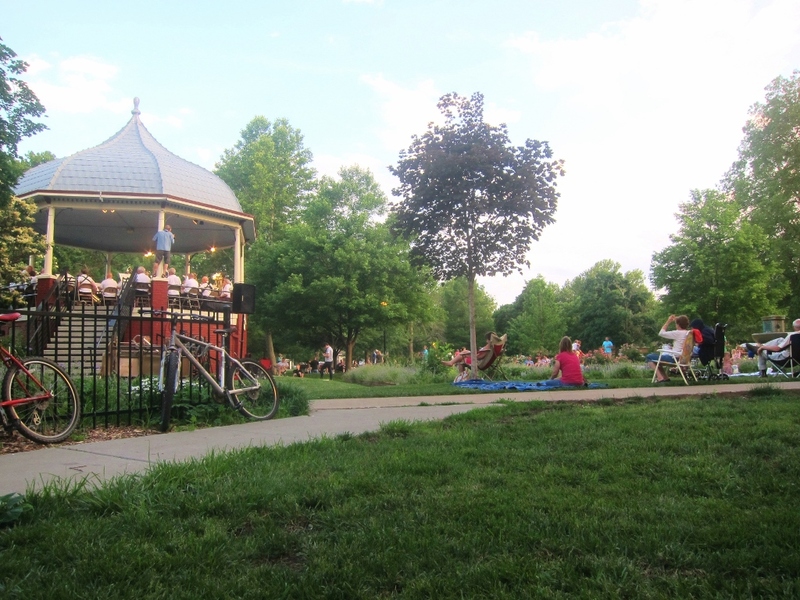 Beyond the concerts, workouts, and festivals, the park offers playground equipment for children, a wading pool, a butterfly garden, picnic tables, and green space for various sports activities. With a location in the heart of downtown Lawrence, South Park is also a convenient place to stop after afternoon shopping or a lunch date. All of this to say, Lawrence has many local businesses we can all appreciate, but the outdoor green space is just as valuable! You don't have to go too far to find beauty here. Find South Park at: 1141 Massachusetts Street, Lawrence KS 66044. This entry was posted on Sunday, June 15th, 2014 at 5:00 pm. It is filed under Events and tagged with concert, date, downtown living, free, music, outdoor. You can follow any responses to this entry through the RSS 2.0 feed.